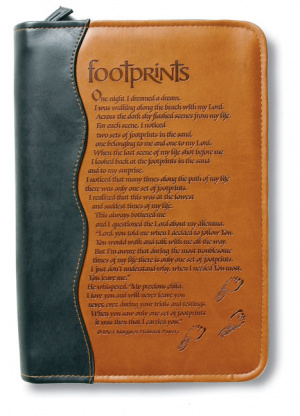 Engraved with the most loved and know Christian poem of all time, this 'Footprints' Bible cover is attractive and inspiring. Footprints Bible Cover (medium) by Margaret Fishback Powers. Helping books and Bibles to look as good on the outside as they do on the inside, these book & Bible accessories have innovative designs, convenient features, and great prices that you will love. This bible cover is size medium and is the perfect companion for any book -- including the world's bestselling Bibles from Zondervan. Footprints Bible Cover: Italian Duo-Tone, Medium by Margaret Fishback Powers was published by Zondervan in February 2005 and is our 10208th best seller. The ISBN for Footprints Bible Cover: Italian Duo-Tone, Medium is 9780310807964. This is a wonderfully made cover. The colour combinations are warm and inviting. The Embossed poem by Margret Fishback Powers is a lovely touch. It's clear to read, beautifully embossed. The leather is soft and supple. The bible fits snugly and the inside zip side has a loop to hold a pen and pencil. One on each side. The stitching is sound and strong. All in all a wonderful cover to protect and present the most important book in your home. I have the Zondervan NIV Study Bible Personal Size, latest edition and it is a tight squeeze as the new edition is somewhat thicker than the one it replaced. Looks good and will offer good protection. Got a question? No problem! Just click here to ask us about Footprints Bible Cover: Italian Duo-Tone, Medium. Are there pockets inside the cover for pens and so on? My Bible measures 16cm x 24cm x 4.5 cm. Do I need medium or large size? A:The large size will be most suitable. The medium cover only fits Bibles up to 224mm by 156mm. In comparison, the large cover will fit Bibles up to 241mm by 168mm. I have an NIV/The Message Parallel Bible in hardback. Do I need a medium or large cover? A:From checking the dimensions of this Bible, we feel that the large size will be most suitable. The medium cover only fits Bibles up to 224mm by 156mm. In comparison, the large cover will fit Bibles up to 241mm by 168mm. I have an NIV Study Bible that the large footprints cover looks as if it would be too big for, will the medium size be big enough? and do I need to remove the bible from the cover to read it? A:We are unable to advise which of the sizes will be most suitable without knowing the exact dimensions of the Bible you have but we can provide more information on the covers which I hope will help. From experience, we find that the internal dimensions of Bible covers tend to be smaller than the external ones shown. The medium cover will fit books and bibles up to 224mm by 156mm and the large cover will fit books up to 241mm by 168mm. The cover is zipped all around to protect your Bible and cases of this design style tend to have a internal flap on either side to secure the Bible making it possible to read without removing it from the case. Will the medium footprints Bible cover fit my NIV Scofield Study Bible III: Black, Genuine Leather, with a thumb index? What are the measurements of the Footprints Bible Cover: Italian Duo-Tone, (Medium) Bible cover? A:The Footprints Bible Cover: Italian Duo-Tone, 44 (medium) measures 18cm x 26cm x 5.3cm, so would be suitable for your Bible. Is this an NLT bible?